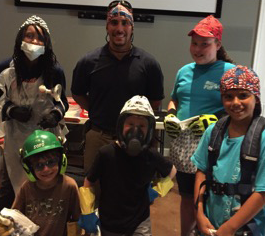 Josh Soto, top center, helps the kids sample some safety gear. Mickey Truck Bodies is partnering with The Dream Center, a free after-school program in Asheboro, NC, to help educate and excite under-resourced children about their career options as they enter into adulthood and the workforce. Joshua Soto, Mickey’s Environmental, Health & Safety Manager, is working with the Center’s Science, Technology, Engineering & Math (STEM) group to give the students a first-hand look at the various responsibilities of an EHS professional, and discuss how his education has helped him excel in his career.